Don't Chase Happiness ! Chase Passion !!! 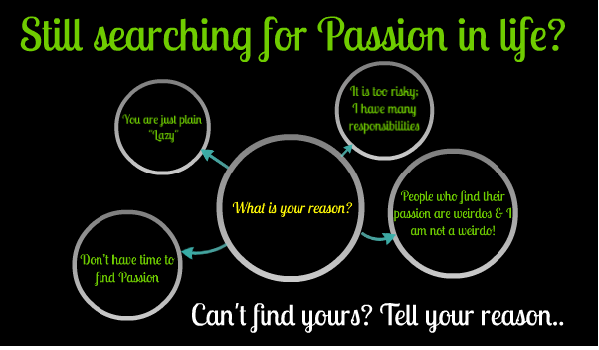 : Found your Passion Yet ? Don't Chase Happiness ! Chase Passion !!! Finding Happiness? Find Passion -Happiness will follow. 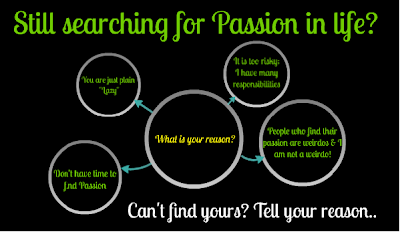 Discover reasons on why didn't you find your Passion yet. Found your Passion Yet ? Seldom have we heard, "This is what I am born to do. And I have found my Passion in Life"
How many of these people, do you think are NOT Happy??? I bet None. Zilch. Zero. We try to find Love, we try to find career, we try to find wealth... Just to find Happiness ! No matter how many times we watch- The Commencement speech by Steve Jobs at Stanford to find our Passion, no matter how many inspirational movies we watch like The Cinderella man, The Pursuit of Happyness, or for that matter read self-help books or watch "The Oprah Winfrey Show", we Never .. Ever find our Passion and the courage to find and pursue what we want. Google finds a staggering 331 million results on 'How to find your passion' ,some say, 'Think what would be your eulogy, some talk about meditation etc. But question is, if we know how to find it, then, Why don't we find it ? Its like, after a year of hard work in office, most of us feel dejected of not being promoted or not being appreciated enough. Till the time we realise, that its again the same time of the next year, and we are being reviewed for our performance- Again! "People who find their passions are actually weirdos and I am not a weirdo! - I am Normal ! " like "Why would someone leave Harvard to start a small software company", which actually later made him the richest man in the world- yes, I am talking of Bill Gates! or may be Mark Zuckerberg .. the list is endless. May be we deceive ourselves,"I have many family responsibilities. I can’t play with future of my kids/spouse. What if I fail ? " Reasons may be many more, but we all know that if we find it, it we would be Happy Ever After, but still, We Don’t! May be, we don’t recognise or even can imagine the VALUE of what Happy Ever After would be. Where do I find it ? And... When & How will I find it? Imagine the whole concept of Work-Life Balance going out of window, if your work itself is your Passion. And then, it’s Passion & Life - No balance required. Right ? So, tell if you have found your Passion ??? And If not, then what is your reason of not finding it yet??? Maneesh is a digital enthusiast & an astute follower of technology innovations & its impact on us.Binary Cognition is a blog written & published by Maneesh about technology, culture, lifestyle & how it intertwines with our hyper connected lives.